In a sign of friendship, the pope and the Grand Imam traveled together in a minivan to Mushrif’s palace, where both are staying as state guests. Throughout the visit, Pope Francis will leave the traditional popemobile behind, favoring a small bus. 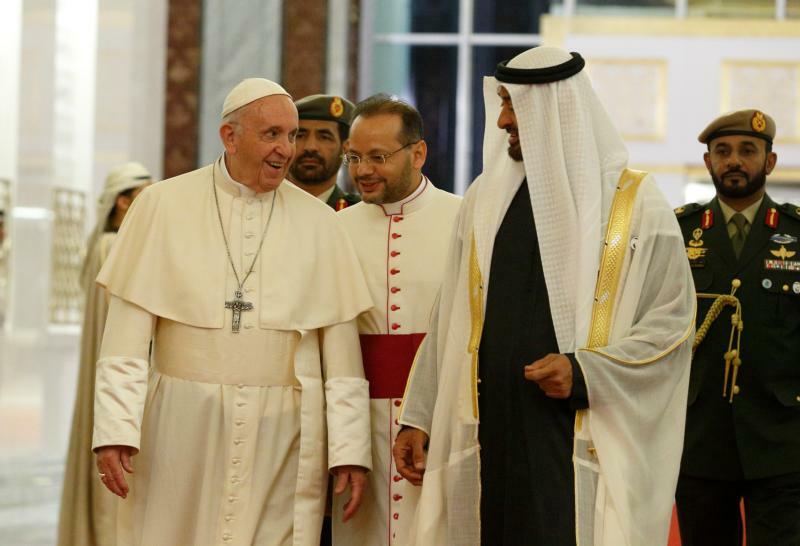 Pope Francis’s schedule includes a meeting with Al Tayeb, who also serves as the chairman of the Muslim Council of Elders, on Monday. Together they’ll close the conference at the Founder’s Memorial, an installation dedicated to Zayed, who’s credited with turning seven mostly rural emirates into one modern, oil-based country committed to religious tolerance, a contrast from Saudi Arabia’s extreme Wahhabism. Many hope Pope Francis’s visit will press for change, perhaps including opening a local office of the papal charitable foundation Caritas, present in over 100 countries.